Earlier in the year I discovered My Big Geek Adventure, created by author L-J Clements, who has been travelling around the United Kingdom and beyond to tick off as many items as she can from her geeky bucket list. Her first book, My Big Geek Adventure, talks about the start of the List, and the journey that followed. Her sequel, which shares the next part of her adventure, has been released today (check out the links at the bottom of this page for more info). I was lucky enough to ask her some questions about her brand new book, The Road to Nerdvana, and her experiences in writing and following her geeky dreams. 1.) For those unfamiliar with My Big Geek Adventure, can you tell us a bit about what it is all about? My Big Geek Adventure is a project that I started in September 2012. I was bored one day and wrote down a list of all the geeky things I wanted to achieve, the people I wanted to meet and places I wanted to visit. I’ve been a massive geek since I was a kid (Buffy the Vampire Slayer and The X-Files were my gateway drugs). I just felt that life was passing me by and all the cool stuff I wanted to do that was linked with my fandoms was not being explored. I wanted to change that, so the List was born! 2.) You say in your book that you had a ‘lifelong ambition to be a writer’ – how does it feel to have your first book published? Pressing upload for the very first time was the most nerve wracking experience of my life. Writing a book is very personal as you put your heart and soul into it, by putting it out into the world you are really exposing yourself. 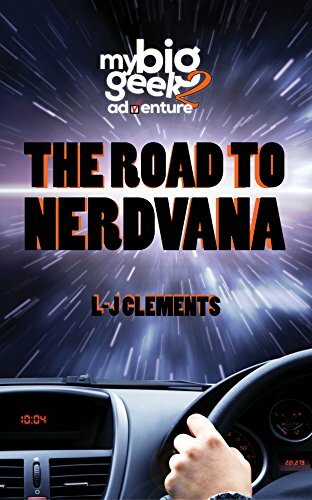 Luckily the feedback has been very positive and then really helped me grow in confidence and continue with the second book, The Road to Nerdvana. 3.) Your first book saw you tackling new experiences and even flying all the way to Canada for one of your adventures! How has doing things on the list changed you? I used to look at events online and think ‘that looks cool, I wish I could go’. Now I look at events and think ‘that looks cool, how do I get there’? It’s about changing your mindset. No one else is going to make your life fun. If you want to do things, you have to get up and do them yourself. Once you start saying yes to things it’s hard to stop! 4.) What has been your most exciting adventure since you started the List? Well, you mentioned Canada, which was a huge deal for me. I didn’t think for a second when I wrote on the List ‘Visit the town of Vulcan’ that I would be standing in it a year later. Meeting Joss Whedon was amazing as it was in Glasgow and he has probably had the most creative influence on me (through Buffy and Firefly). 5.) Do you have any advice for fellow geeks hoping to create their own bucket list? Think big! I know most people would say ‘just put a few things down and see how you get on’ NO! If you want to do one hundred things, put one hundred things on the list! Just by writing them down you are making your interest in them more concrete and that helps you work towards achieving them. Just think how proud you will be when you cross the first item off your list. 6.) Your second book is coming out soon – where is the List taking you this time? I am so excited and nervous about the second book. It’s called The Road to Nerdvana and it’s a continuation of the adventure. This time around it focuses on road trips and we travel around the UK discovering geeky treasures. So as well as crossing items of the list it poses important questions like ‘who would be the best road trip companion’? 7.) Do you think the List will ever be completed or will it always be an ongoing adventure? The List has a life of it’s own. As I change and my tastes change and the world changes, so does the List. It will never be completed and I am 100% OK with that. I never want the adventure to end really! I’d like to say a huge thank you to L-J Clements for finding the time to answer my questions amidst the mayhem of releasing a new book! This sounds so exciting, I think we all need a geek list in our lives!